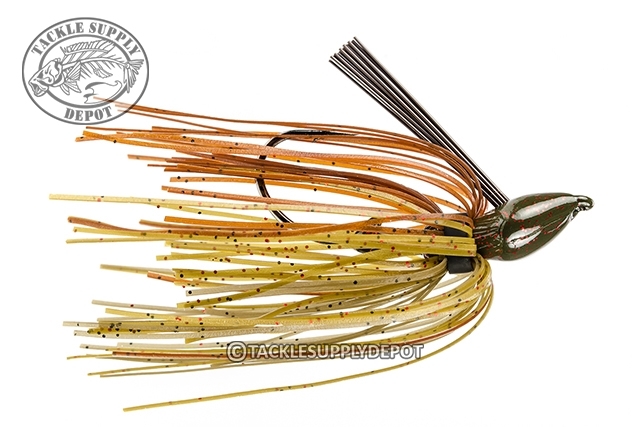 Now offered in a scaled-down version of its incredibly effective bigger brother; The Strike King Benny Brauer Baby Structure Jig is ideal for those extra tight areas as well as around high pressured fish. The design of the Structure Jig and the Baby Structure Jig is to increase the hook up ratio and decrease the tendency to hang up versus traditional jigs used for structure fishing. The special Owner 2X strong Cutting Point hook has a Zero degree line tie for a straight pull with the hook point for better penetration while the unique Cobra Head's position puts less material in the hook gap for a better bite and its tapered nose helps reduce lip blow out. The Cobra Head shape and weed guard angle reduce hang ups and the wide bottom footprint of the head help increase feel of the bottom. All this combined to make the Denny Brauer Structure Jig the best jig you can cast to structure, hook up and land the big ones!